Amelia Mary Earhart was born on this day in Atchison, Kansas in 1897. Today is the 115th anniversary of her birth. Earhart was a nurse’s aid at Spadina Military Hospital in Toronto, Ontario, during WWI. She was there when the Spanish Flu broke out in 1918 and she was hospitalized for pneumonia and sinusitis. She suffered from chronic sinusitis for the rest of her life. She took her first lesson at Kinner Field in Long Beach in 1921. She had to take a bus and then walk four miles to get there. She cropped her hair and bought a leather jacket to ward off the chill morning flights (Amelia slept in the jacket for three nights straight to break it in before she dared to wear it to the field.) On Oct 22, 1922 she broke the altitude record for a female pilot by flying over 14,000 feet, and on May 15, 1923 she became the 16th woman to earn her pilot’s license. Family financial problems limited her time in the air as Amelia took jobs as a photographer a teacher and a social worker. But with Lucky Lindy’s solo flight over the Atlantic the hunt was on to find the first woman to fly (either solo or with a crew) over the ocean too. Amelia was chosen to join pilot Wilmer Stultz and copilot/mechanic Louis “Slim” Gordon. They took off from Newfoundland and landed in Wales about 21 hours later. Although her contribution to the flight was minimal — she kept the flight log and later said she that Stultz did all the flying and she was as useful as a “sack of potatoes” — it was a publicity smash. They returned to New York to a ticker-tape parade and were greeted at the White House with a reception by President Calvin Coolidge. She become romantically involved with George Putnam, who had handled the publicity for the trans-Atlantic flight, and (after Putnam proposed six times) the two married in February of 1932. Amelia saw the marriage as a partnership. Their honeymoon was a lecture/promotional tour. She also did a number of endorsements for luggage, clothing and cigarettes. She became an associate editor for Cosmopolitan. And she and Lindbergh promoted commercial air travel, investing in Transcontinental Air Transport (which later became TWA). In May of 1932, 5 years after Lindberg’s trip, she became the first woman to fly solo across Atlantic (she landed in Ireland.) 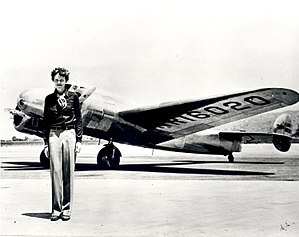 She also flew solo from Hawaii to California, from LA to Mexico City and from Mexico City to New York. Amelia was one of the organizers and the first president of The Ninety-Nines, an organization that advanced the cause of women in aviation. In 1936 she started to plan a trip around the world. The first attempt ended in Hawaii when a blown tire (or perhaps pilot error) when the plane ground-looped. The damaged plane and the deflated crew went back to Oakland, CA. For the second attempt Amelia and Fred Noonan headed east, to Miami. They made several stops in South America, Africa, India and Southeast Asia. On June 29, 1937 they landed in Lae, New Guinea. The next stop would be Howland Island… but the plane never made it. An intense air and sea rescue attempt ensued, but after searching a quarter million square miles of ocean the US Government gave up. This entry was posted on Wednesday, July 25th, 2012 at 12:01 am	and tagged with Amelia Earhart and posted in Amelia Earhart, American History, History, postaday, Thought of the Day, Today's Birthday. You can follow any responses to this entry through the RSS 2.0 feed.